Platform construction and installation is not the only source of offshore waste. Day-to-day operation also generates both hazardous refuse and much ordinary detritus, sent ashore for sorting and deposition. Shell was the first operator on the Norwegian continental shelf to introduce waste sorting when Draugen came on stream, closely followed by Conoco on the Heidrun field. Norske Shell had long been paying attention to the environment. This concern focused in the 1980s on production processes and limiting waste, but a shift occurred in the following decade towards products and ways of reducing consumption. 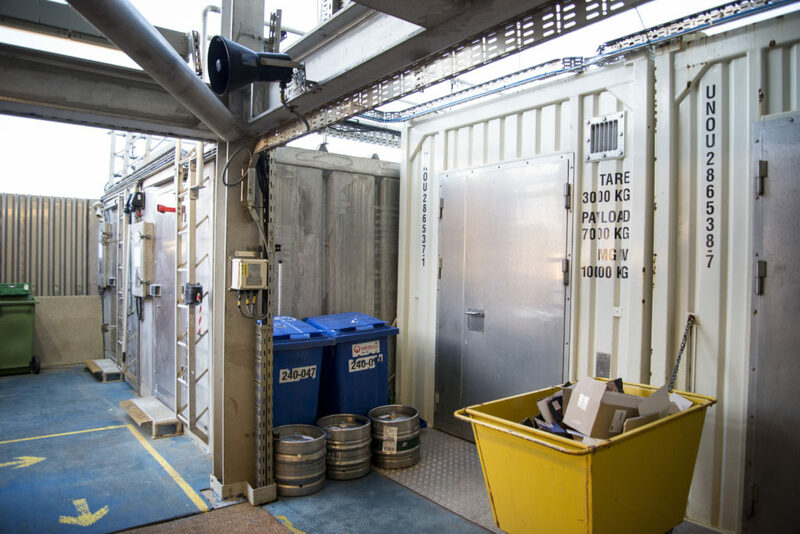 Goals for the company were to ensure acceptable disposal, while also minimising refuse-related costs through optimal sorting offshore and contributing to a system for reducing, reusing and recycling waste. Employees were asked to concentrate on three areas – avoiding hazardous organic solvents, reducing the use of one-off items and preferring products which left returnable waste where possible. [REMOVE]Fotnote: Shell Internt, no 1, 1994, “Fokus på miljø”. Extensive use of environment-friendly products represented one aspect of this commitment, but reducing consumption was considered equally important. 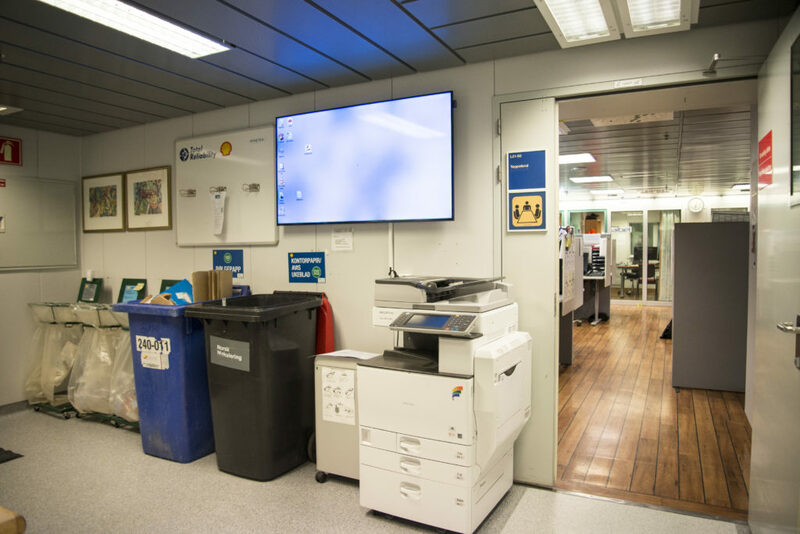 A simple system for sorting waste based on separating it into different containers was instituted by Norske Shell on the Draugen platform from the start. This proved both protective of the environment and cost-saving. Waste sorting was also introduced to the Kristiansund operations office at Råket and to Vestbase. Separating refuse in this way was pursued in collaboration with Renovasjon Nord AS,[REMOVE]Fotnote: Renord AS was its official name initially. a new privately owned waste-handling company in Kristiansund. 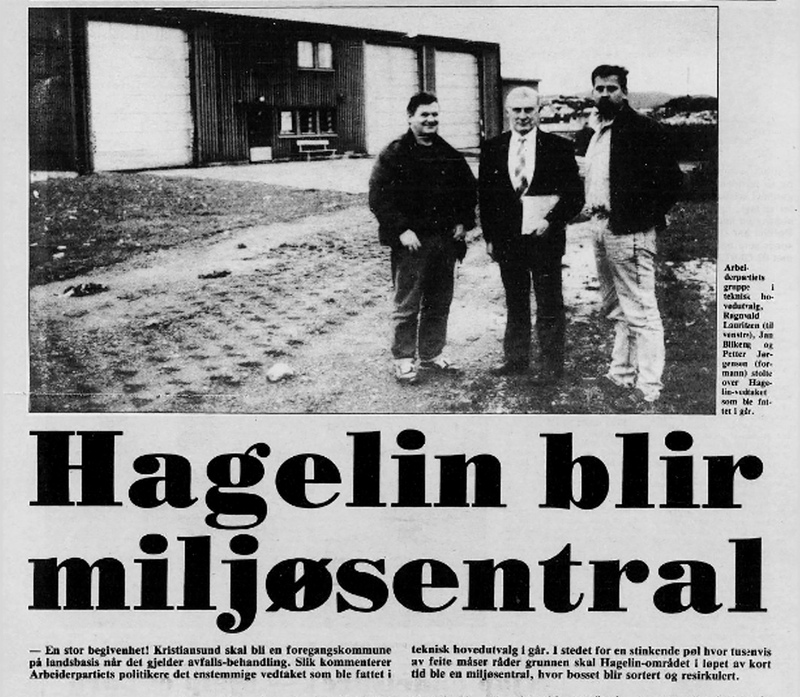 The latter became a Norwegian environmental pioneer in 1990 when it built a recovery plant for industrial waste at Hagelin in its home town. While a number of countries in continental Europe had already begun sorting such refuse, the infrastructure for doing so in Norway was poorly developed. The Renovasjon Nord plant accepted all forms of industrial detritus – paper, plastic, wood, glass, cardboard and metals – and was based on manual sorting. These materials were sent to various recipients in Norway, Sweden and Finland for recycling. Although starting with industrial waste, the company entered into an agreement with Kristiansund local authority which allowed the latter to introduce waste sorting in the autumn of 1990. The sorting project was tested out on West Vanguard, the rig drilling subsea wells on Draugen, before being adopted on the field. This trial proved a success. Underlying the move was the hope of saving NOK 1-1.5 million through waste sorting – combining environmental concerns with financial benefits. With interest in waste treatment and sorting growing among ordinary people and politicians in the late 1980s and early 1990s, Norske Shell and the Draugen organisation timed this initiative well. “Sustainable development” entered common parlance in 1987 when it was introduced in a report from the UN’s World Commission on Environment and Development. This concept indicated that global development had to meet people’s current needs but avoid undermining opportunities for future generations. The Norwegian government rose to the challenge and appointed a commission of inquiry to address such issues as how to minimise waste. That covered reducing refuse at source as well as reuse and recovery of materials, while also minimising demands on society’s resources for waste handling and treatment. [REMOVE]Fotnote: Report no 44 (1991-1992) to the Storting: Om tiltak for reduserte avfallsmengder, økt gjenvinning og forsvarlig avfallsbehandling. Oslo, Ministry of the Environment. A Norwegian official report (NOU) on waste minimisation and recycling appeared in the autumn of 1990. [REMOVE]Fotnote: NOU 1990: 28: Avfallsminimering og gjenvinning. Oslo, Ministry of the Environment, 3 December 1990. It marked the first overall assessment of these issues presented to the Storting (parliament). [REMOVE]Fotnote: Recommendation no 56 (1991-92) to the Storting: Innstilling fra kommunal- og miljøvernkomiteen om tiltak for reduserte avfallsmengder, økt gjenvinning og forsvarlig avfallsbehandling (Report no 44 (1991-92) to the Storting). In 1990, the latter resolved that all local authorities in Norway would be required to draw up a plan for waste sorting by 1992. [REMOVE]Fotnote: Report no 44 (1991-1992) to the Storting: Om tiltak for reduserte avfallsmengder, økt gjenvinning og forsvarlig avfallsbehandling. Oslo, Ministry of the Environment. Increased awareness of issues related to refuse, resource use and the environment was also reflected in the media, and leading Oslo daily Aftenposten ran a series on the “environmental office”. Appearing in the summer of 1992, this tested attitudes and actions among chief executives in large Norwegian companies – what had they done or not done to make daily life more environmentally conscious at Norwegian workplaces. The sort of questions asked was whether waste paper was sorted, whether single-use or multi-use cups were provided for coffee and whether pens were throwaway or refillable. Local authority plans for waste sorting were followed up by the Pollution Control Act of 1993, which again called for local councils to prepare waste plans by 31 December 1993. The government’s aim was that waste should cause as little harm and inconvenience to people and nature as possible, while costing a minimum to deal with. When choosing between reduction choices, in other words, preventive measures would take precedence over recycling and environmentally acceptable final treatment. The principal government strategy was to prevent waste arising, reduce the quantity of hazardous substances, promote recycling and ensure that ultimate treatment was acceptable. [REMOVE]Fotnote: Gjerde, Kristin Øye (2015): Sprenger grenser. Vann, avløp og renovasjon i regionens tjeneste: 105. 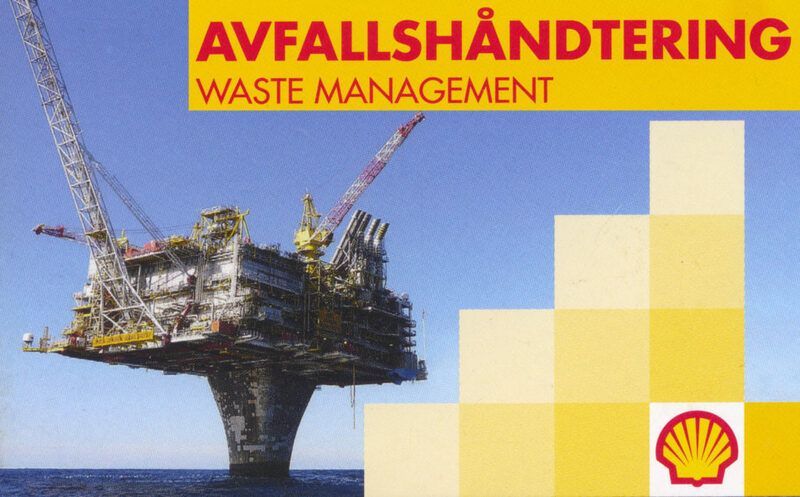 So waste sorting was not an unfamiliar concept in the early 1990s, but Norske Shell and its Draugen organisation were nevertheless pioneering industrial adopters of this approach. They can largely thank Renovasjon Nord for this. The company saw the potential of rubbish at an early stage and built land plants for its satisfactory treatment. 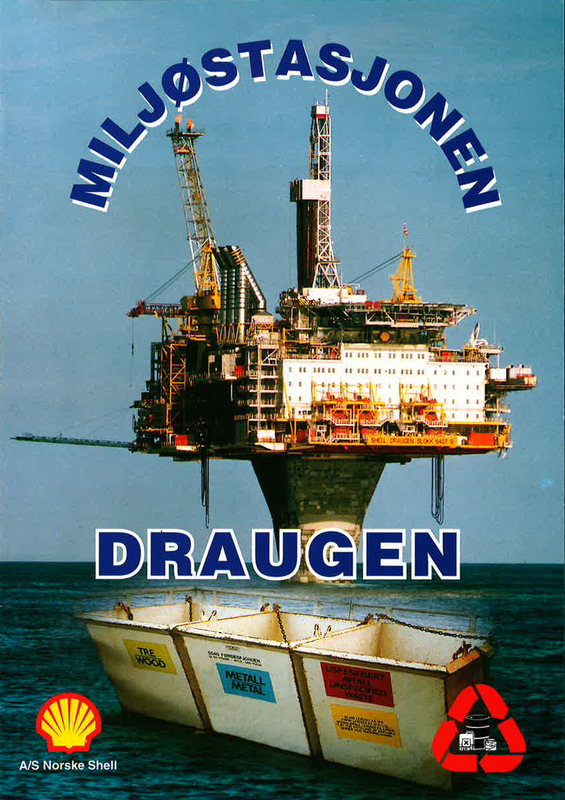 [REMOVE]Fotnote: Shell Internt, no 2 1993, “Milliongevinst for Shell”. 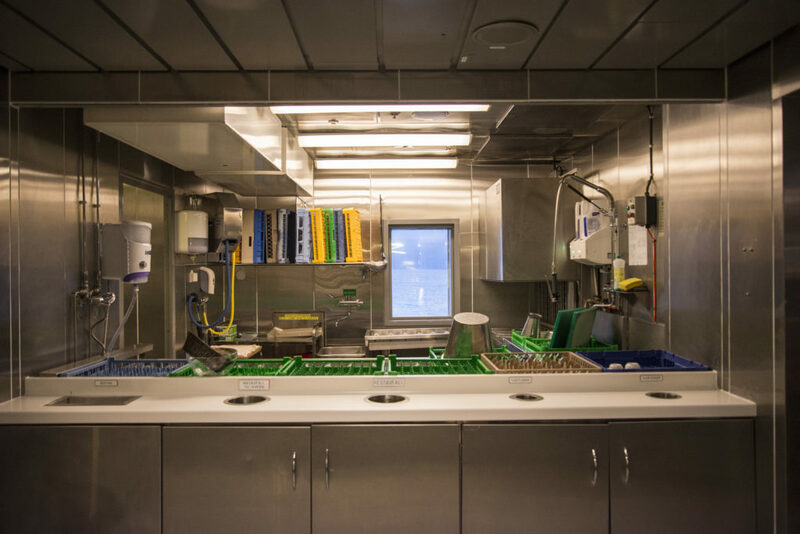 It was both the first and the largest Norwegian specialist in handing waste from the offshore sector.